Feeling so much better today….thank goodness! I ended up having dinner with a fellow Camiga last night, chatting about her Camino Frances. Took a selfie for her mum who has also read my book and was excited that her daughter was dining with an ‘author’. What a giggle. As I sit here in yet another bar (using the wifi), I’m listening to Phil Collins and “Another Day in Paradise”. I’m thinking how lucky I am to be here right now. I’m so aware that I am living an incredible experience, one that I do not take for granted. None of us know what is around the corner and I’m appreciating every breath I take, every moment of this wonderful life I have. I don’t write these blogs and post my photos to boast about my life, I merely want to share it with you and show you things you may otherwise never see or hear about. The simple pleasure of sitting in a park, a cafe or getting lost in a foreign place is one of life’s greatest joys to me. I have now made good friends with the waiter, Oscar, and he keeps sneaking over and re-filling my glass without me noticing (doesn’t charge me for it.) Don’t know if it’s a good thing or not! Am I getting a reputation or does it already precede me??? Today, I bumped into Tony Jacques again and almost didn’t recognize him as he was fresh from the barber-scrubs up ok! He almost seemed lost without his buddy Ray who went home yesterday. We watched the most bizarre thing in the street too. A (?) Swedish guy playing didgeridoo with an Indian playing a sitar in the streets of Santiago! All cultures moulded into one but it was great. I have now just met a lady called Petra. She lives on the Mornington Peninsula and so we had a long chat. 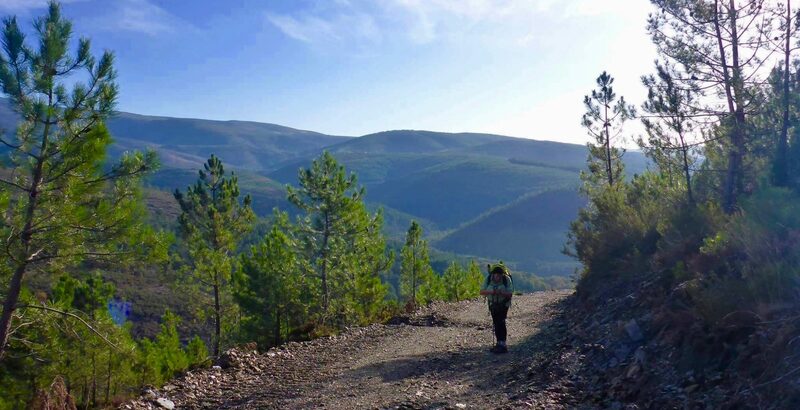 Petra has just walked a camino with her son, overcoming big health issues and is feeling so proud of her achievement. I love these chance meetings. Everyone has a story! I have just come back from an afternoon trip to Sigueiro, a nearby town on the Ingles Camino. Walked through the beautiful park and then down to the river. It was in oak forest. I shuffled through the autumn leaves, listened to the birds and the water rushing by and paddled in its icy-ness, all the while pinching myself at how lucky I am to get to see this…how lucky I am to have Gonzalo as a friend. We sat by the river in the sun, had a drink, chatted for a while, and then he delivered me back to town. I’m a happy girl today! How do you get in touch with Gonzalo? Previous PostPrevious What Song is That?